Two of my favorite foods are chocolate and peanut butter, and when you combine them… it’s like heaven! My team had a training at work a week or so ago, and to keep us up and energized the coordinators put bowls of candies and mints on the tables. I usually try to stay away from those deadly mini candies, but by the end of the day I had about 5-10 little Reece’s Peanut Butter Cups. It was unfortunate, and forced me back to the gym, but it did get me thinking about a creative way to create one big Reece’s Cups. When I got home that night I started googling all sorts of different recipes and came across Leite’s Culinaria’s: Chocolate-Peanut Butter Tart. With a peanut butter cookie crust, peanut butter mousse and a thick layer of chocolate ganache it sounded like the perfect combination of all of my favorite things! Let’s start with the tart crust because that’s the most time-consuming. First, whisk together the flour, baking soda and salt in a small bowl and set aside. If using a food processor: Attach the metal blade and process the sugars for several minutes until very fine. Keeping the motor running and add in the butter cubes through the top shoot. 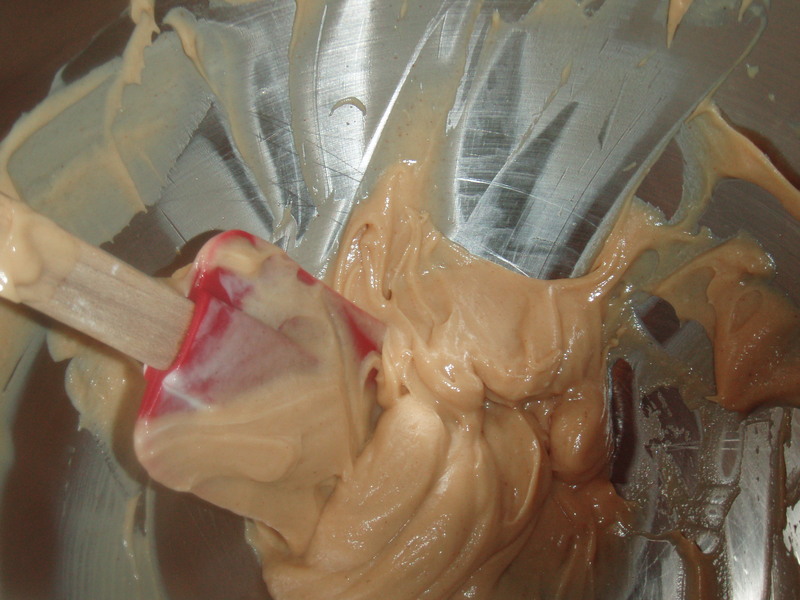 Then, add the peanut butter and process until smooth and creamy (about 10 seconds). Keep the motor running again to add in the egg and vanilla and process until incorporated. 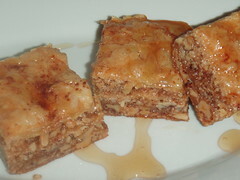 Scrape down the sides of the bowl then add in the flour mixture and pulse until incorporated. If using an electic mixer: In a mixing bowl, beat together the sugars until they are well mixed. Add in the butter, which will have to be slightly softened, and the peanut butter and beat for several minutes on medium high-speed until very smooth and creamy. Add in the egg and vanilla and beat until incorporated. Scape down the sides of the bowl as needed. Reduce the speed to low and gradually beat in the flour mixture until just incorporated. The dough should be pretty greasy and smooth. Transfer the ball to a bowl, cover with plastic wrap and refrigerate for at least 1 hour or overnight. 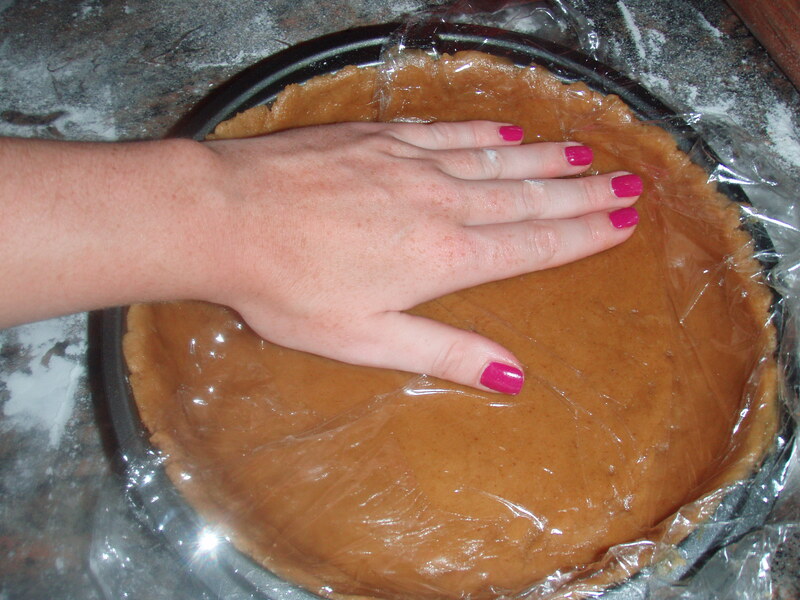 Once refrigerated, take the ball of dough out of the fridge and place it in the middle of a 9″ tart pan. 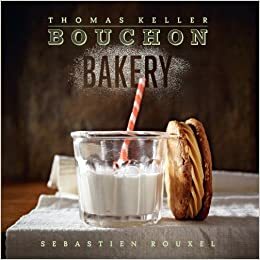 Place a piece of plastic wrap over the dough and begin to gently and evenly press the dough into the pan, pressing it against and up the sides. 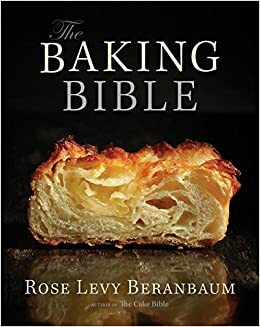 If the dough softens and sticks to the plastic, refrigerate it again until it doesn’t stick anymore and if the dough tears, simply press it together again. 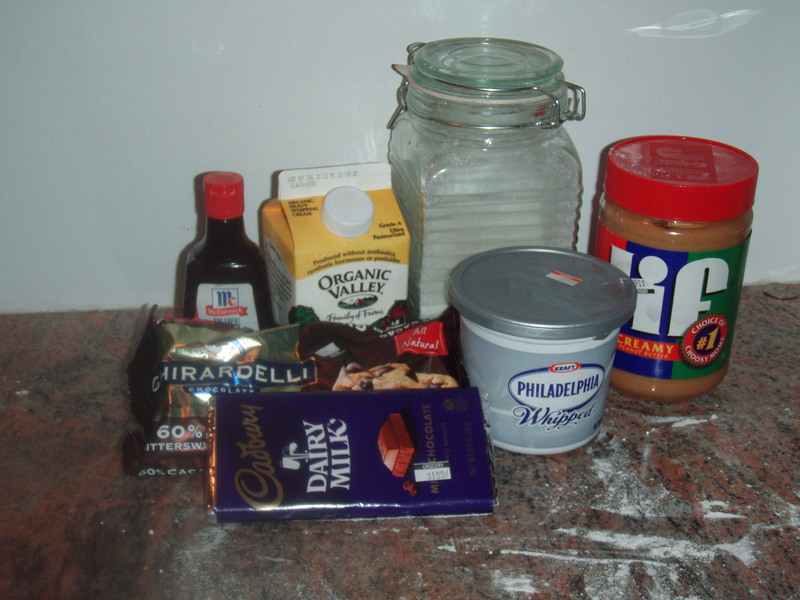 Finally we are ready to create the Peanut Butter Mousse filling. 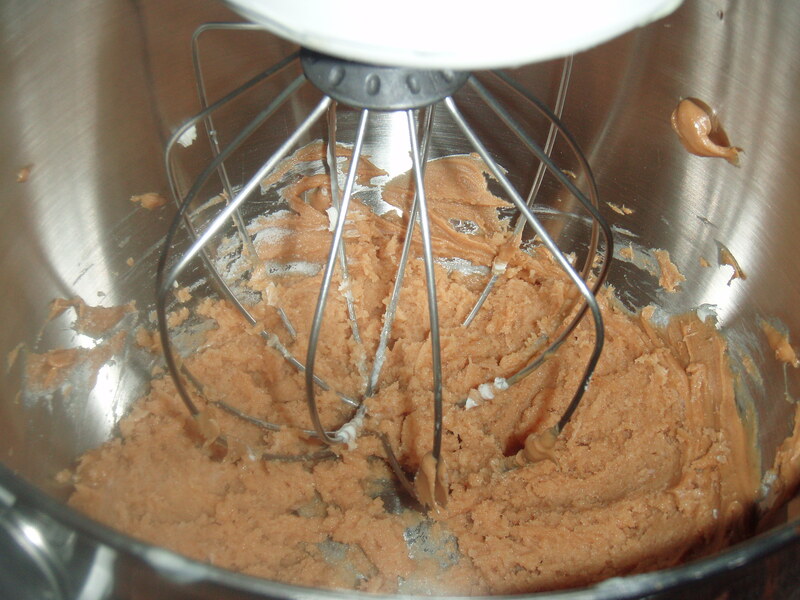 In the bowl of a standing mixer, fitted with a whisk attachment, beat the cream cheese, peanut butter and sugar on medium speed until it becomes uniform in color. Reduce the speed to low and add in the vanilla. Beat in 1/4 cup of the whipped cream just until it is incorporated. With a large rubber spatula, fold in the rest of the whipped cream, mixing until the mixture is well blended but still airy. 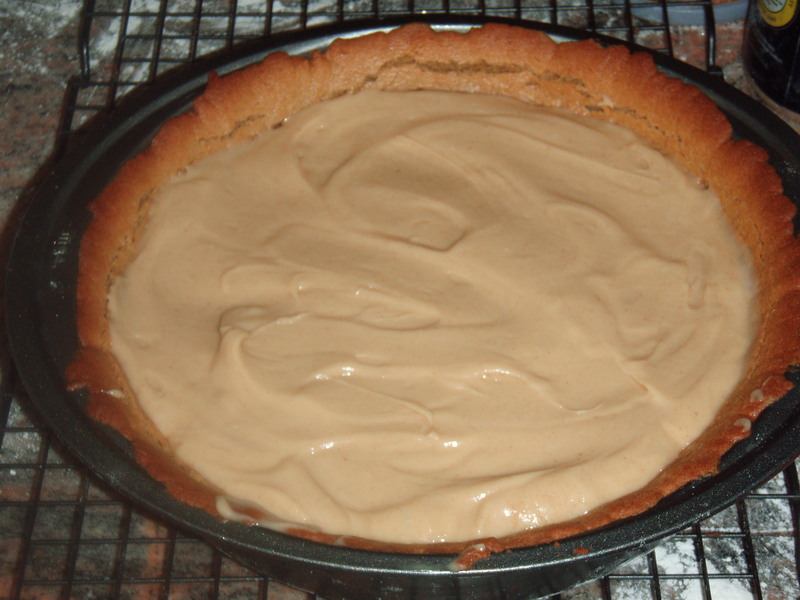 Once the tart crust is completely cooled, scrape the peanut butter mousse into the tart and smooth so that it’s level. refrigerate the tart for about an hour. While the tart is chilling in the fridge, let’s make the Chocolate Ganache topping. We are going to follow the same method we used for the Birthday Cake recipe. Break the milk and bittersweet chocolate into several pieces and place them in a food processor fitted with the metal blade. Process until the chocolate is finely ground. In a small saucepan over medium heat, bring the cream to a boil. With the food processor running, pour the hot cream through the feed tube into the chocolate mixture. Continue to process until smooth. Add in the vanilla and pulse a few times to fully incorporate. 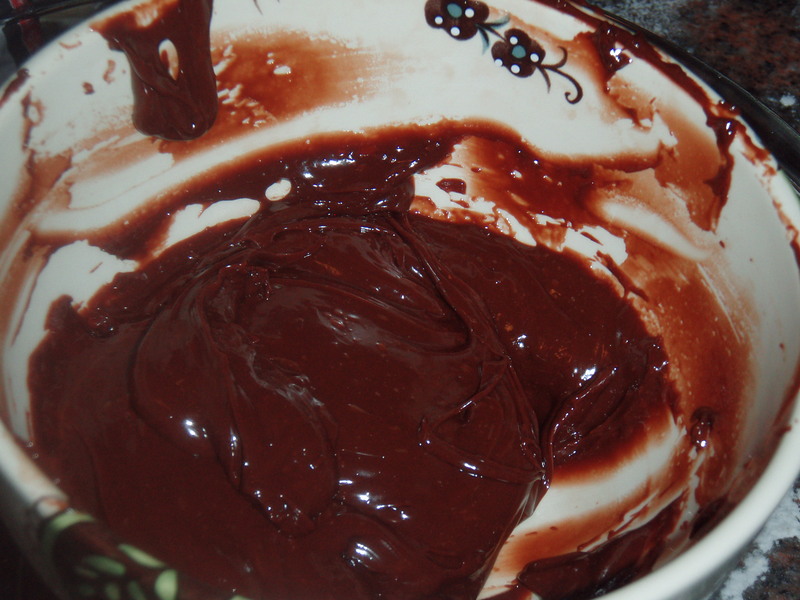 Transfer the ganache to a bowl and cool to room temperature. 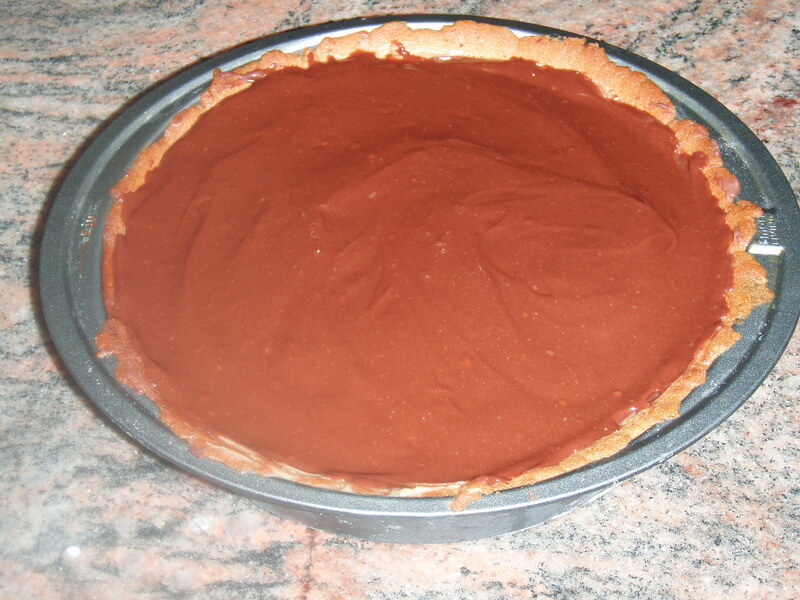 Once the tart is finished cooling in the fridge, pour the ganache over the peanut butter mousse in a circular motion, being careful so that it does not land too heavily in any one spot and cause a depression in the mousse. Using a small metal spatula, start to spread the ganache to the edges of the tart. Then spread evenly to cover the entire surface of the tart. Refrigerate the tart for at least 2 hours to set or up to 5 days. OMG this looks YUMMY! Reeses is by far Taylor’s favorite all time candy and I can’t wait to make it for her!!!! peanut butter but your Butter Tart sounds good to me. Thanks Shaun! It was my first time making anything like this, so it was a learning experience for me too. Hello there, I found your blog by way of Google even as looking for a similar topic, your web site got here up, it appears great. I have bookmarked it in my google bookmarks.